Are electronic cigarettes bad for you? The shocking truth. But if you change the question to: Are electronic cigarettes safer than tobacco cigarettes? You’d get a very different answer, at least from scientists involved in ecigarette research. That’s because while ecigarettes are not healthy for you in an absolute sense, many scientists believe they could be 100 or more times safer than their tobacco equivalents. 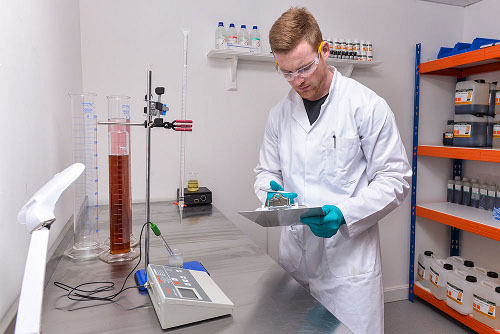 Pharmacologist Gwyn Taylor analyses an eliquid base in the Smoker’s Angel laboratory. David Sweanor, winner of a WHO medal in tobacco control. Click here for more ecigarette quotes. One criticism of electronic cigarettes is that we don’t know the long term effects of using them. So why do so many scientists believe ecigarettes are safer than tobacco cigarettes. The answer is 1. basic science and 2. The ingredients used. The big problem with cigarettes is not the nicotine but the smoke you breathe in. When you burn cigarettes, you create smoke. In this smoke are thousands of chemicals, dozens of which are carcinogenic (cancer causing). The idea with e cigarettes is to eliminate the part which causes you most of the harm (smoke, tar, carcinogens) replace it with well-studied alternatives that mimic the smoke and throat hit you get when you smoke (propylene glycol, in use since the second world war, and vegetable glycerine) and retain the part which you enjoy (nicotine). The point was well proven by an FDA analysis of eliquid. 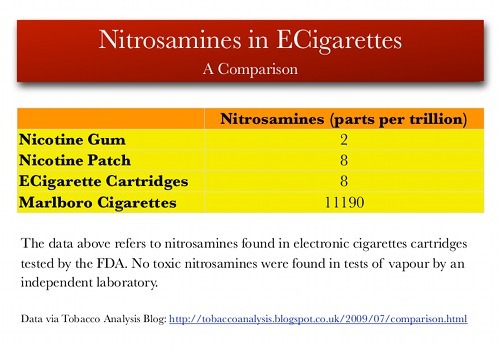 Despite using innovative techniques to study ecigarette ingredients at a minute level (the FDA were looking at parts per trillion) , the FDA only found one possibly carcinogenic agent (nitrosamines) in eliquid, and that at quantities 14,000 times lower than those found in Marlboro cigarettes. In recent years a huge amount of studies have been conducted into electronic cigarettes. While it’s not possible to quote every study here (if you would like to read more, I recommend visiting ECigaretteResearch and CASAA), here are 8 key studies you need to know about if you are worried about ecigarette safety. To find out the effects of inhaling pure nicotine, researchers put rats into a chamber and pumped in nicotine for 20 hours a day, five days a week over two years. No increase in death rate, and tumours, although there was some weight loss! 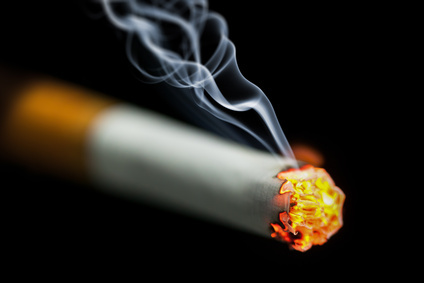 See Inhaling Nicotine Doesn’t Hurt But It Could Make You Thinner Say Researchers for more information. For more studies on nicotine, check out this great post on ECigaretteReviewed. Propylene Glycol, a key ingredient in your ecigarette, has been used for decades, and is used in asthma inhalers and in air-conditioners. In fact, it’s even been used to sterilise the air in children’s wards. Propylene glycol has been well studied, including one study in which rats and monkeys were made to inhale and ingest high levels of proplyene glycol over a period of 12 months. Assurance that air containing these [ecig] vapors in amounts up to the saturation point is completely harmless. A study by Siegel and Cohn reviewed 16 analyses of electronic cigarettes. A study by WHO expert Andreas Flouris found that vaping has no effect on your blood stream. In contrast, smoking lead to an increase in your white blood cell (lymphocyte, and granulocyte) counts. White blood cells are known to increase when carcinogenic/smoking damages the cells in your body, in order to attack/remove these damaged cells. Click here for our summary of the full study. 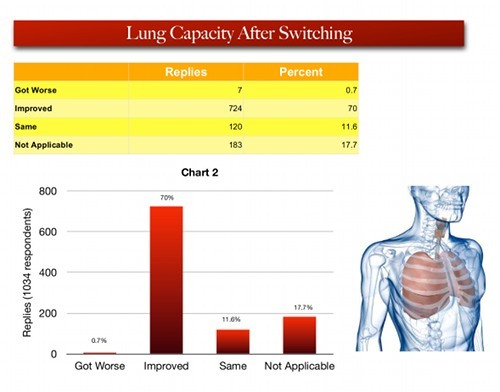 A year ago we asked a thousand vapers about the effects of vaping on their lung capacity. A separate study found that ecigarettes can temporarily cause an increase in your airway resistance. Although some newspapers reported this as study as proof that ecigarettes cause damage to lungs, scientists such as Professor Siegel argued that an increase airway resistance, which can also be caused by warm humid air, is not lung damage. Dr Farsalinos studied the effect of electronic cigarettes on cardiac function. It [the e-cigarette] is the only available product that deals with both the chemical (nicotine delivery) and psychological (inhaling and exhaling ‘smoke’, holding it, etc) addiction to smoking, laboratory analyses indicate that it is significantly less toxic and our study has shown no significant defects in cardiac function after acute use. See Electronic Cigarettes and Heart Disease for the full story. Back in 2009, when there hadn’t been many studies into electronic cigarettes, I worked with researchers from the University of Alberta to study the short term effects of ecigarettes on health. 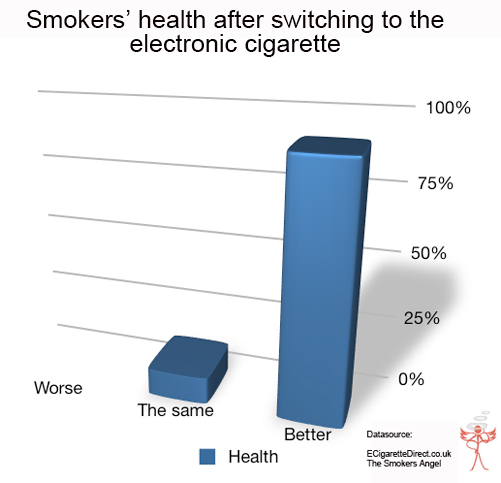 We found that 90% of vapers reported an improvement in health after switching to electronic cigarettes, despite the majority using ecigarettes for less than six months. Specific improvements reported including a drop in smoker’s cough, and an increased ability to do exercise. Respondents also reported an improvement in smell and taste. 1. When diacetyl has been found in eliquid, it has been at levels 10-100 times lower than that found in cigarette smoke. 2. 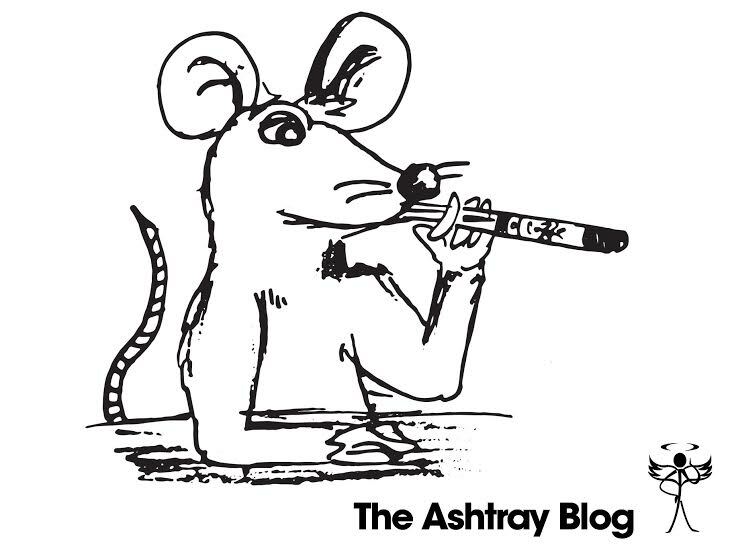 Diacetyl doesn’t cause popcorn lung in smokers. 3. ECITA members actively test for diacteyl in eliquid, and if any is found the eliquid is withdrawn from sale. At ECigaretteDirect we’re going a little bit further by introducing in-house GCMS testing, which will enable us to test every batch of e-liquid to the same standard as a government approved laboratory. While scientists have argued that ecigarettes are better for you than regular cigarettes, it doesn’t mean they are safe in absolute terms. 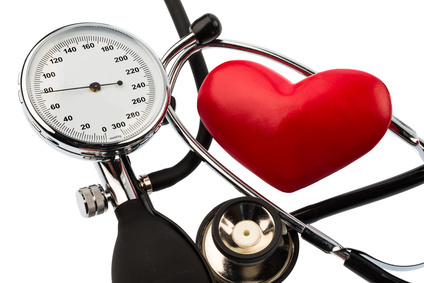 And we know that, like caffeine, nicotine can raise your blood pressure. Of course, if it’s a choice between using nicotine with tars and dozens of carcinogens and using just nicotine, you’d be better off with just nicotine. 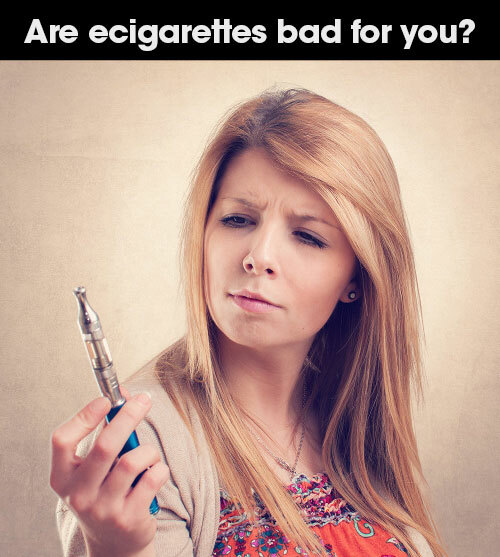 In a small number of cases, impurities have been found in eliquid, including diethylene glycol (see Diethlyene Glycol in ECigarettes: What You Need To Know for more information). To avoid the risk of this, make sure you only use suppliers who test their eliquid for these impurities. Our own testing is done in UK government approved labs. Additional risks may occur with hardware. Two problems we have seen include lead used in the solder in batteries and chargers, and chargers that do not have overcharge protection. It’s also worth bearing in mind that some certificates from China have been falsified. For peace of mind, look for products which have been UK ROHS tested. Safe doesn’t exist. But electronic cigarettes are low risk compared to regular cigarettes. It’s the equivalent of having a four-wheel-drive Volvo compared to a high-powered motorcycle with bald tires in an ice storm. There are people who will tell you that inhaling anything other than air is not a good idea. And they are probably right! 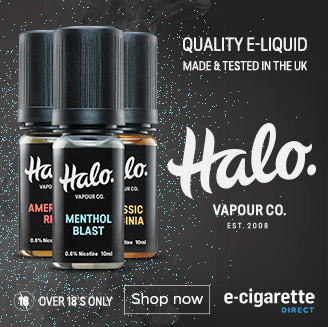 But ecigarettes, which use ingredients which have been well studied and which have been approved for inhalation, make sense when they are viewed as an alternative to smoking. From a health point of view, quitting is the best option. But if you can’t or don’t want to quit, you’re better off with ecigarettes than with tobacco cigarettes. So if experts think ecigarettes are better for you than tobacco cigarettes, what’s the shocking truth? The shocking truth, as revealed in leaked memos/letters like this and these, is that large pharmaceutical companies are actively working to destroy the ecigarette industry that threatens billions of pounds in their revenue. Pharmaceutical companies, which bankroll many doctors, researchers and anti-smoking organisations, want to protect the nicotine cessation industry. And tobacco companies, while introducing lookalike ecigarettes, don’t want to deal with the competition from the small innovative companies that currently dominate the market. Have I missed anything out? Let me know in the comments! Find this article of value? Please share using one of the share buttons below. Help us improve this post and you could win an awesome Aspire Mini Nautilus Vertical Coil clearomiser (with variable airflow control!) AND a Vision Spinner 2 battery in our monthly draw. After reading this post, is there anything else you need to know? The 37 Most Shocking Anti-Smoking Ads Ever – But Do They Work? Thanks, Gareth, and quite agree with your comment on air! I think for many users how they feel after switching is just as important as all the studies! Haha, very good. It sounds like the last argument against vaping, when all other arguments are exhausted ! Thankyou for the continued & very informative blog. Shared. Thanks Ray, glad you found the article useful! Now this is the kind of information that needs to be out there. More and more they are trying to keep the truth from getting to the general public. Protecting profits over protecting the lives of the citizens that they have sworn to protect is ridiculous. I say we are smart enough to know that switching to E-Cigarettes is better than analogs. If you want to help us, quit trying to ban the safer alternative in order to make a profit!!! Thanks, Anthony, glad you found it useful! As its always been said vaping is better than smoking, but don’t get me wrong, I choose to vape rather than smoke, I know that there still some risks with vaping but when measured against smoking I feel its no worse than breathing in air near a busy road, in fact I feel vaping is even less damaging than that. Of course we don’t really know what the flavourings could be doing in our lungs but as far as I have read and seen, its pretty minor when compared to smoke. We all know that smoking tobacco especially ready made cigarettes is an extra nail for our coffin. Why the governments of major countries do not like vapes is very simple answer. They loose too much revenue by way of excise on tobacco. In Australia the excise on tobacco is 65% on Vapes it is only 10% and unless they increase the Goods and Services Tax or Value added tax as it is known in some countries, they are screwed. Further to this they do not want our populations to live to a ripe old age and smoking and other harmful substances like alcohol; which by the way also generates a very high excise tax for the governments; helps to legally euthanise us all. That way the governments do not have to budget for the care of elderly folk if they die early in life from all these poisons. Nicotine in e-juice will not kill you, but the crap they put in cigarettes certainly will and in a very nasty way. Ever seen anyone die of lung cancer or other respitory diseases caused by smoking. One of our staff members, a registered nurse certainly sees it on a very regular basis. Great article James. I will take a lungful of vapour any day of the week over breathing the air in Sydney CBD. The people who want to ban e-cigarettes on grounds of public health spout junk science and ideology while forgetting the inconvenient truth that car exhaust fumes (and even air fresheners!) contain more harmful particles than e-liquid vapour. Thanks, Alisha, glad you found it useful! Useful article with well-rounded information. Ecigs are not healthy in the way “an apple a day” is healthy, but the main point is that they may be quite safe -and it seems that it’s immensely safer than cigarettes. it for me.I found myself cheating a little bit, smoking the odd cig..
give regular fags a thought. I do find injecting the oil a bit of a problem. Always happy to have feedback, John!